1.) Lazy Bones Skeleton Onesie by Dolls Kill - This is the perfect thing to wear curled up on the couch, reading the latest spook story or watching horror movies. Let your inner skeleton shine through, haha! 2.) Spider and Web Knit Scarf by Sourpuss - Wrap yourself up (and protect your neck against vamps) with this wonderfully webbed spider scarf. It is made with vegan materials and does not contain any wool (leave that for the sheep, where it belongs). 3.) Horror Stayin' In Knit Sweater by Killstar - This sweater lists everything I need in life, especially during the winter months. 4.) 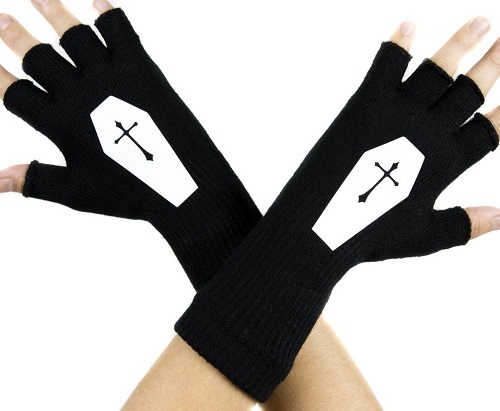 Casket Fingerless Gloves by Dysfunctional Doll - My hands are always the first to get chilly during the colder seasons, and I love fingerless gloves since I can still type and text while keeping toasty. Love these with lovely caskets adorning them! 5.) 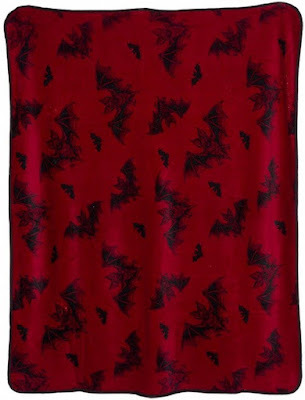 Wormwood Lace Shawl by Killstar - I am living for this gothic-grandma chic lace shawl! Again, it is made with vegan materials and is simply gorgeous. When not using it to wrap up, it would make a lovely decorative throw or tablecloth. 6.) 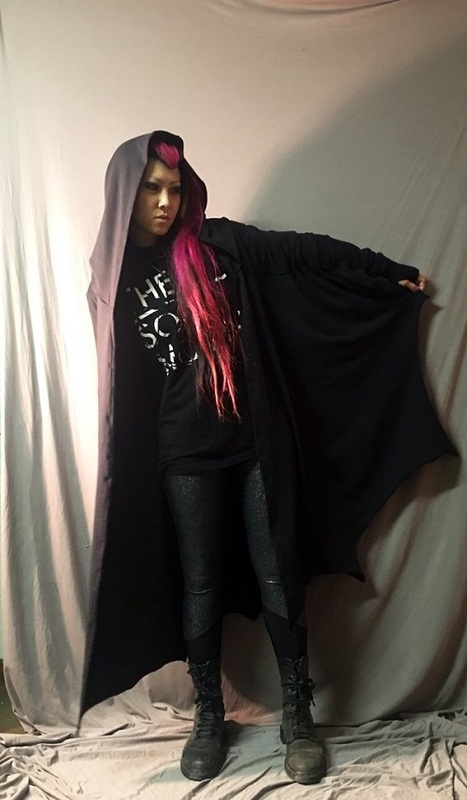 Bat Cardigan by Sophi Reaptress - Owning one of Sophi's creations has been on my bucket list for quite some time, with this bat cardigan being at the top of my wish list! It looks perfect to wrap up in at home or go out in. 7.) Everyday is Halloween beanie by Sourpuss - If you're here, you probably live Halloween year-round, and I love that you can proclaim that with this cozy beanie. It is made with all vegan materials and does not contain any wool. 8.) 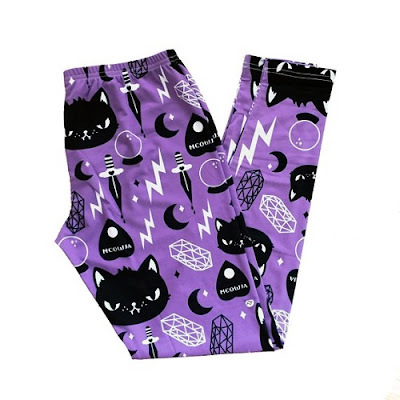 Cat Magic Leggings by Em and Sprout - I love these purr-fect leggings, they would make a fine addition to a cozy autumn or winter ensemble. 9.) Helsinki Hooded Scarf by Killstar - Thank goodness that more vegan-friendly materials are being used in knit designs, like this hauntingly beautiful hooded scarf. You can wear with the hood up or down, and it has such a stunning look to it! 10.) Black Velvet Darby Boots by StrangeCvlt - Velvet everything this time of year! 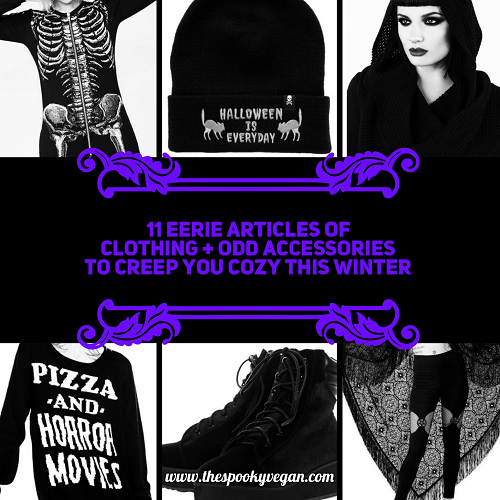 These vegan velvet boots will top off your soft and spooky look this winter! 11.) 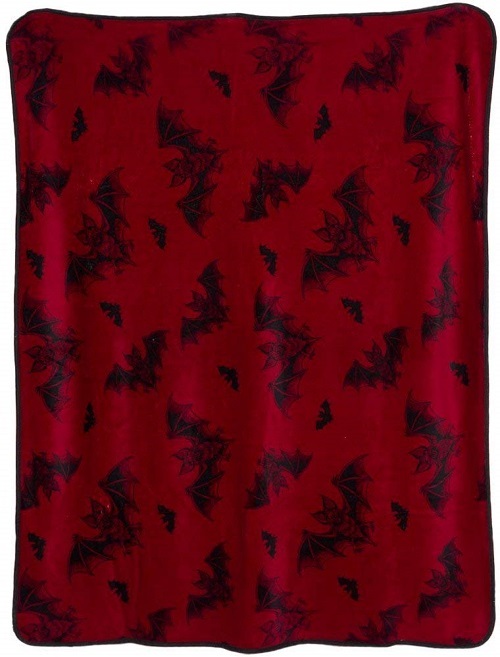 Bat Attack Blanket by Sourpuss - Ok, so you can't wear a blanket (well, you could, but...), but you definitely need a little extra coziness this autumn and winter, so why not treat yourself to this batty blanket so you can cocoon yourself on the couch? Hope these creep your autumn and winter months cozier this year! I love the shawl! I'm a huge fan of shawls and cozy clothing. My mother just bought me a black blanket coat for my birthday. It's kind of like a more stylish Snuggie. It's a fleece blanket cinched at the sides to create arm holes. This one also has faux fur-lined hood. It's so cozy and perfect for watching scary movies in the dark!